Denna produkt ger dig 872 bonuspoäng. Badlands färdiglimmade 2.8' All Terrain Tires Mounted on Desperado Black Rear Wheels, 1 par. passar bl.a. för Electric Stampede/Rustler Rear. This is a pair of Badlands 2.8" (Traxxas® Style Bead) All Terrain Tires Mounted on Desperado Black Wheels (2) for Electric Stampede®/Rustler® Rear. For all you Traxxas® Stampede® and Stampede® 4X4 fans the wait is over for an all-terrain and aggressive 5" tire. The Badlands tire offers motocross style tread mounted on Desperado 2.8" wheels . It is made strictly for the MX'er in you. Its oversized lugs offer you the ultimate in grass and dirt shredding performance under all-terrain conditions. 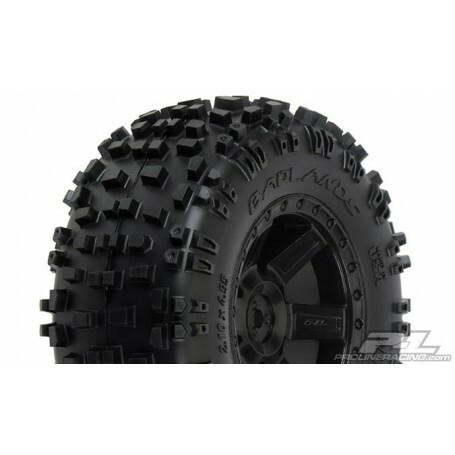 This tire will also work on your Traxxas® Rustler® or JATO®, if you are looking for a huge tire. The lugs are designed to ensure longevity while digging up the surface below. Made from durable M2 (Medium) compound, the Badlands tire is poised for battle and ready to take your 1:10 truck to the next level. Pro-Line's highly anticipated new 6-spoke wheel will make your truck the toughest looking one on the block. The Desperado wheel is a one-piece glue wheel made out of extremely durable nylon material and features a molded in bead-loc ring for an awesome scale look. This is a 12mm hex wheel. Make your truck stand out from the rest and get some Badlands 2.8" tires mounted on Desperado 2.8" wheels today! When running your Pro-Line Tires in Water, Mud, or Sand foreign materials can enter the Tire. If this occurs, the foam Inserts can begin to break down and the tire can become excessively heavy or unbalanced, causing unnecessary wear. Placing a piece of waterproof tape (such as Duct Tape) over the Wheel Vent Hole is a quick and easy method of preventing anything from getting inside Your Tires.